On the steep hill, the border of Kanonkop reserve and above the town centre of Montagu, along the R62, on a property called by locals “hooggenoeg” or in free translation “high enough”, inspired by European monasteries and African traditional building, the environmentally and ecological responsible Mountain View Lodge Montagu was erected in 2013. Relax in total privacy while enjoying our spectacular mountain views. Just above the town centre of Montagu, still within walking distance, Mountain View Lodge in Montagu is almost completely concealed from the street, this means privacy, relaxation and a 24h monitored and secure location. The multiple Eco-Award winning property features an outdoors seasonal heated swimming pool and a deck which overlooks the town and valley. Each of the seven individually decorated room has garden views. They come equipped with a king-size bed, a fan, a dressing and a safety deposit box. The private bathroom has a shower with free toiletries. Hairdryers are available on request. Two of our rooms have interconnecting doors and can be converted into a 4 person family room. The Belgian Restaurant at Mountain View Lodge Montagu serves traditional Belgian and South African cuisine for guests on reservation. The bar has a wide variety of Belgian, imported and local beers as well as a collection of local wines. Free Wi-Fi and private parking is available. Attractions in the area include wine tasting at the wine farms along Route 62, river trips on the authentic River Goose, mountain bike routes and hiking. Montagu Golf Course is a 4-minute drive away. Chauffeur-driven trips are available for guests to book, Wine Tasting Tours, Big 5 Game Drives, City and Off-road trips. Cape Town International Airport is 182 km from the property, the Montagu Hot Springs only 2 km and Robertson is less than 30 km. 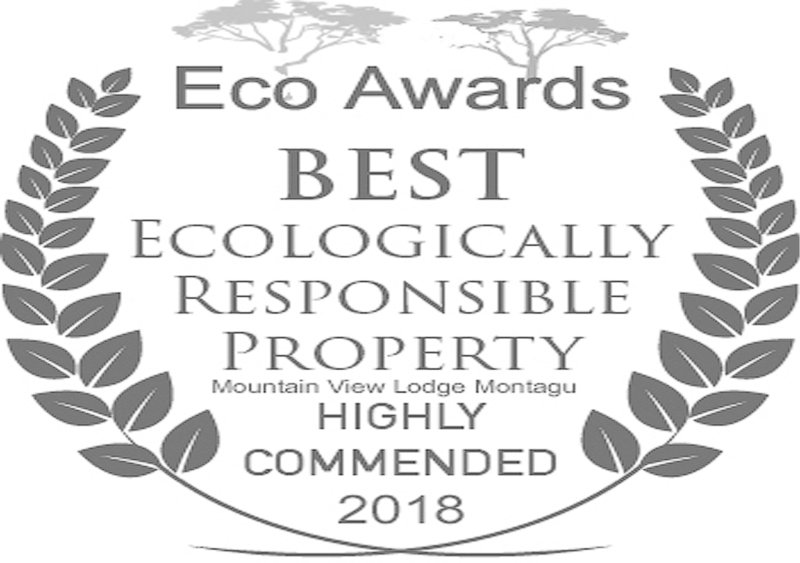 The lodge is registered as an ECO-accommodation and has since the opening been granted several rewards and recommendations as ecological responsible. Simple things like shower and basin water is recycled, filtered and reused for irrigation and flushing toilets, we banned tumble dryers (towels and bedding are a bit stiffer) and strictly limit the ironing. Laundry is done with ecological responsible soaps only. The rooms are ecologically designed (less windows) and naturally insulated (using amongst others air), to keep the temperature as stable as possible. A natural cool airflow is created in a rear corridor and as it should with an ECO-LODGE we have no Air conditioners nor additional refrigerators in the rooms. Guests can explore the wine route, go on a Big 5 Game Drive or explore the off-road country with our own R62 Adventure Tours.